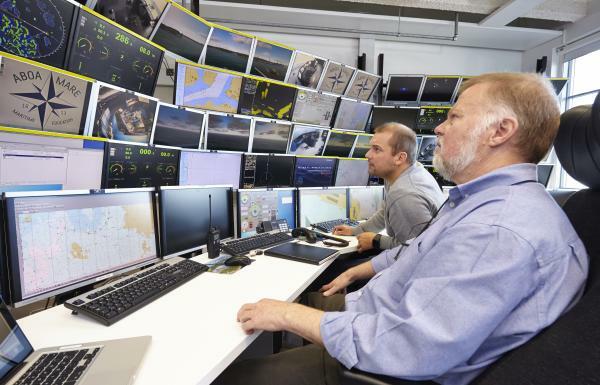 In our simulation department, you find ten different ship bridge simulator facilities. Our bridges are made of real consoles and equipped with real instrumentation, that you find onboard ships in real life. You can do your training with some of our existing ship models and sailing areas or you can request your own ship model(s) and area(s) to be tailor made by us to fit your needs. All our ship bridge simulator facilities can be joined together in the same sailing area in the same exercise or they can be used individually. 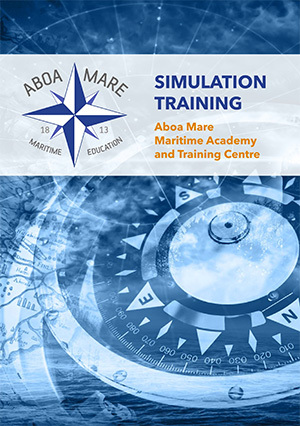 This enables us to create large and very complexed scenarios with several ship bridge simulators involved for instance in a search and rescue training or we can use one ship bridge simulator to create a very in depth and pinpointed environment for a specified need, for instance a training in a specific harbor. 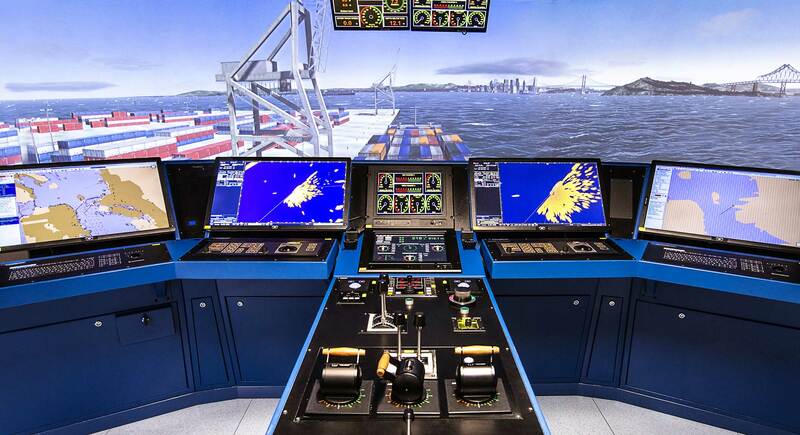 All ship bridge simulator facilities are equipped with a visualization system that compromises at least 210° field of horizontal and 35° of vertical view that can be rotated and tilted in any way the user would like to. The viewpoint can also be switched to match various needs. At Aboa Mare we are in close cooperation with the leading shipping companies in Northern Europe. We have for instance a tailor made Wärtsilä NACOS Platinum ship bridge simulator corresponding to the installation onboard Viking Lines passenger car ferry M/S Viking Grace. 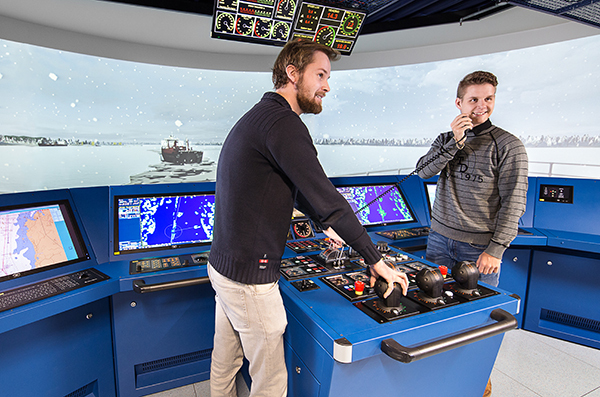 This ship bridge simulator is used by Viking Line, Destination Gotland, Tallink Silja, TUI Cruises and Eckerö Line just to mention the most frequent users. We can also offer a ship bridge simulator equipped with the latest Sperry Marine Visionmaster FT integrated bridge system. This system is for instance used by one of our clients, Finnlines. You can also find Sperry Marine Visionmaster FT integrated bridge system on many cruise ships. On our Transas ship bridge simulator you will find a more generic layout on the instrumentation and controls. This is very effective if you are in for a more general approach to the training when it comes to the equipment. You can instead focus in detail on training areas, ship models and the actual key issue that you are training, if it then is maneuvering, search and rescue or whatever topic that is your interest. 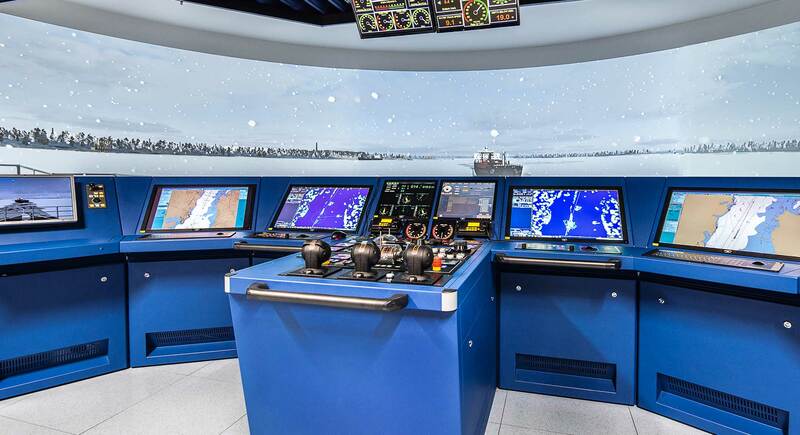 On a Consilium ship bridge simulator you will utilize a complete integrated bridge system with double sets of Consilium ECDIS and radar with ice radar capabilities. Consilium equipment is used by our following clients; the Finnish and Swedish icebreakers and on the Finnish owned tanker fleet.